It's the larvae which cause damage to silk, wool, fur and textiles. Look for creamy white grubs with a coating of hair or ladybird like adults with brown and cream spots. They are around all year but more common from April to June. They love dark places under furniture and along skirting boards. How can I tell I have a problem ? 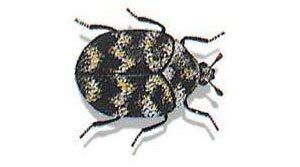 - If you are seeing adult carpet beetle regularly then the problem is advanced - most people get textile damage before they see the adult beetles so it is best to act fast!